This is a very silly story. Unapologetically and unashamedly so. After a season of drama and miss-paced adventures, to have something that is perfectly set and pitched, (even if is a slightly daft parody riddled with inaccuracies) is wonderful. This has to be one of my favourite stories of the season to date, which makes the fact I have very little to say about it rather hard. The cast shine, and the dialogue sparkles. It’s the best giant bug ever in the series (although the competition is a bit manky). Body count seems relatively low (and I don’t remember the reason for the second murder being explained outside of Confidential, or worked out why Agatha was linked to the Vespiform when Felicity Kendal was wearing the stone). The denunciation is remarkably early in the piece, however the show isn’t meant to have the pace of a murder mystery, but a mickey-take of a murder mystery (I kept expecting the Two Ronnies to turn up with the Phantom Raspberry Blower, although the poisoning scene was pinched from the equally silly Prisoner adventure The Girl Who was Death). Wouldn’t want to have more than one story like this in a season, but all in all, great fun. Next Time: Someone is murdered in the Library… hang on? At last it seems the months of speculation, rumours and in some corners, fervent wishing have come to an end, and it has been officially announced that Steven Moffat will be taking up the keys to the good van Doctor Who from Series Five. By which we assume, the full series, and not the currently-being-filmed 2009 specials. It is, of course, huge news – arguably the biggest since the series’ return, and though the impact on fandom on the Web has already been very large (we only appear to have just literally woken to the report here in NZ), there’s still a good deal we don’t know about what lies ahead. These are perilously early days, but it would appear that the days ahead, and the new series, are both in very good hands indeed. Moffat is for the mean-time a busy man – he is scripting the Tintin movies, and has a new series Adam and Eve in production with wife Sue Virtue. We’ve a year of specials (numbers of which depend on semantics) to get through first, and before then, the rest of Series Four. But fandom is an impatient beast, willing to leave half a plate unfinished to skip to dessert, and cheese, coffee and after dinner mints. If there was ever an example of rude haste, then we’re it. The remaining days of Russell T Davies’ vision of the revived series are yet to play out. We can assume however that the transition will be a gentle one. So ZeusBlog‘s prediction for the months to come is more of the same, but in different ways. You’ll likely hear lots of cheering and a few hearts being broken, the odd “too soon!” and questions about whether this new broom will usher in a new Doctor with it (definitely a “too soon” question to be asked). People will recall Blink and The Empty Child and imagine them to be the template for the series to come. I disagree. Some will cheer the end of bottom and fart gags in the series, forgetting that Moffat also gave us The Curse of Fatal Death. As seen in his other series he’s a man of varied stories and interesting turns, and he will surprise us. So it may not be time yet to get out that Photoshop montage you’ve been working on for your Forum avatar featuring James Nesbitt as the Eleventh Doctor with his companion Sally Sparrow. The future is over a year away, and as usual, much of it isn’t yet written. In the mean-time, we can be grateful that the series continues to be popular and entertaining. Here’s to the days ahead and those beyond. It’s not that we were all merrily lead up the garden path thinking we would see revelations about the Doctor’s past. It’s not the fact we’ve seen it before, you’d need a long memory for The Ark, or a fairly good book collection for Father Time. Even Martha traipsing round the surface of a desolate planet doesn’t grate after last years finale. The regulars are on top form, with a refreshing lack of Donna “funny” set pieces (although there is an obligatory “You’re brilliant” – methinks they protest too much) the titular guest is easy on the eye, and everyone does fairly well. It’s just too damned short. It’s full of great ideas, good concepts, but like (and even more than) Pompei and Ood (and I know I sound like a broken record) everything is crammed in and rushed. The story is a bit of a run-a-round, but there is so much potential; The Hath look great, but lets see more of them, why are they there, what is their history? Why was the map and other information hidden? Why is the human protagonist so much older than his clone troopers? Martha’s surface trek seems too quick a jaunt, Jenny and the Doctor seem to bond too quickly. Given what could be done, given the scope of who Jenny is and what she means to the Doctor (given Helen Raynor spent two episodes rewriting Daleks Take Manhattan with Sontarans in it) it all just seems too pat and too easy. Because the really worrying thing is this is a setup, a quick bit of groundwork for something else later on. Mid-season is usually where Rusty starts lining up the pieces for later on (Dalek/Long Game, The Cybus Stories, Saxon references in Lazarus/42), and if so, it all seems like such a waste. Cribbens! Tate! That cameo! RTD finally beating the press to a spoiler!! Surely the best season opener yet? Before we all plumped for Adiposemania (we did. That as the idea, wasn’t it?) There was ample evidence to show the spirit of cottage industries and free enterprise unshackled by copyright issues so prevalent on the World Wide Web these days. Back in those heady early March moments you could have had one of Miss Foster’s finest fashioned (or sort of fashioned) in crochet, modelling clay or – what looked like plasticine… and it could be yours! Or go to the highest bidder. Hang on… they seem to have all gone. I wonder where? A VIDEO GAME AT LAST! …and it’s based on the highly popular Top Trumps card game. Oh yes. Er, why? Hardly a thrill a minute, surely? Oh so you didn’t want to see more of a Timelash cast (ahem) member than you’d bargained for? Then why did you buy Zygon then – silly boy? 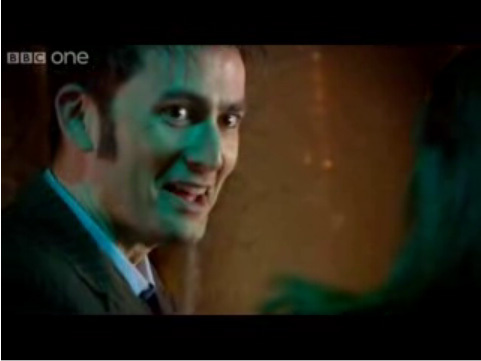 FOUR TO DOOMSDAY OUT SOON? Now, it is true that we know so little about telebiogenesis, but this tid-bit of gossip has us interested. Especially when you consider the potential – Davison’s lowest rung combined with the promise of a Davison/Sutton/Waterhouse/Fielding commentary. Just turn the picture down and the sound up – brilliant! even more like another one of those ‘Who F*rted’ pictures? It had to happen sooner or later. Poor Tosh. 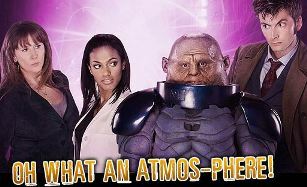 Generally the reviews on the boards seem quite in favour of the new Sontaran two-parter, old monsters returning with gusto and more pizzazz than, well, the other, more lacklustre early two-parters of previous seasons. And really that isn’t a good yardstick to compare these episodes by. Having felt that a bit of extra time would’ve benefited both Fires of Pompeii and Planet of the Ood to expand plot strands and ideas that were begging to be developed, Stratagem and Sky seemed too much like a runaround. By co-incidence I ended up rewatching Girl in the Fireplace shortly after seeing the closing episode and it simply brought home to me (as Jamas noted in his blog) that this is just a really good Sarah Jane Adventure story. It has it all, simple plot, in-jokes, turns-out-nice doppelganger, lots of action, backyard setting, eco-theme, villainous kid, and cutesy aliens. I never thought I could describe the Sontarans as cutesy – but here they’ve taken one of the series’ design classics and tweaked it out of skew. It’s not that they’ve made them short (they always were stocky, but they never made jokes about it before; I don’t see Pertles or Tom B wrestling with Chris Ryan); it’s not that they dressed them in baby blue (though black always looked niftier); it’s not even that they’ve turned them into cut-price Klingons; it’s because they’ve made them so bad at it. After years of lone clones living by their wits, the warriors have arrived en masse, but seem a lot less sharp for it, the new army less than the sum of its original parts. All the bluster about honour, and yet they resort to subterfuge, using kids and look-alikes (a Rutan method), shooting the unarmed as sport – they used to be even more shrewd and cunning, but they didn’t prattle on hypocritically about it. All the moaning about females (whereas they used to be a curiosity), they seem more like gung-ho schoolboys. The aliens of this story could be almost anyone, just with a lot of Sontaran window dressing, like the good old probic vent; their only weakness… that and bullets. The new Sontarans have no fear of death, which is handy, as they seem far too good at it. Donna continues to shine, although some of the set pieces (“you’re leaving?” TARDIS key) are such parodies they detract from the plot. Bernard Cribbins needs to do a Mickey and come onboard for a stint on the ship (although given the behind the scenes reasons for his casting, the way his character is developing may be in slightly pour taste); even Sylvia gets a chance to look good (how would’ve we reacted to Jacqui or Martha’s Mum with an axe?). Sadly they had to clone Martha to give her something productive to do, but all this aside it all just seems far too clever, mummy jokes, handy hammers, but really it’s almost an exercise in ticking the boxes: bring back Martha, tick; UNIT, Sontarans, tick, tick. Valiant, family issues, special effects, obligatory Rose reference etc. Given the potential scope of what could be done with these two episodes what we’ve been given just seems a little mundane. Blogging can be backbreaking work. But there was no need for him to take it so literally. Not even a year on from an arm-breaking effort in his own back yard, Peter A has upped the ante with a weekend accident on a friend’s trampoline, landing with some force on a stationary obstacle and fracturing his vertebra in the process (L1 for those of you keeping score at home). After a two-day stay in hospital, he’s now home and braced-up, on heavy medication and muttering feverishly about “making a man” out of all the various x-rays of limbs collected over the life of ZeusPlug (score to date: a head, lower torso and an elbow). His message: apologies for the delay in Fast Return and new series reviews; normal service will resume shortly.